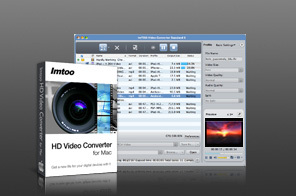 ImTOO HD Video Converter for Mac is a powerful Mac HD converter to convert between HD videos, convert HD videos to general videos, convert video to audio, and convert between general videos/audios. It supports most of HD video formats like AVCHD (mts, m2ts), H.264/AVC, H.265/HEVC, MPEG-2 (ts), DivX, HD WMV, MPEG-4 and Quick Time. Besides, the smart HD Video Converter for Mac can also extract audio from video to MP3, WMA, WAV, M4A, AAC. With the HD Converter for Mac, you can convert HD videos to general videos like AVI, MPEG, WMV, MP4, DivX, RM, MOV, FLV, and watch movies on your Mac, iPod, iPhone, Apple TV, Xbox, PSP, PS3 and more digital players. ImTOO HD Video Converter for Mac offers the full support of HD videos that helps you convert HD videos including AVCHD (mts, m2ts), H.264/AVC, H.265/HEVC, MPEG-2 (ts), DivX, HD WMV, MPEG-4 and Quick Time with high image quality and top sound quality. The Mac HD video converter makes it possible to watch high definition movies in 720p and 1080p resolutions on your HD video players. As perfect AVCHD, MTS, M2TS converter, ImTOO HD Video Converter for Mac can convert AVCHD (mts, m2ts) video to many other HD videos or SD videos. Convert between HD video formats; convert AVCHD, H.264/AVC, H.265/HEVC, MPEG-2 (ts), DivX, HD WMV, MPEG-4 and Quick Time videos and convert HD videos to SD (standard-definition) videos. Convert between SD video formats like AVI, MPEG, WMV, MP4, DivX, RM, MOV, FLV; convert video to MP3, WMA, WAV, M4A, AAC audios; convert between audios; convert CDs to audio files. Allow you to exactly trim your video file to retain desired video clips and cut out unwanted video segments. Provide the highest converting speed and convert two or more files in batches at a time with just one click. Enables to transfer output files to iPhone 4 directly after conversion. Fully support various multimedia devices including iPod, iPhone, Apple TV, Xbox, PSP, PS3, PMP, and mobile phones. Support HD video decoding and encoding, HD DV like AVCHD DV, MPEG DV, and converting videos recorded from HDTV.